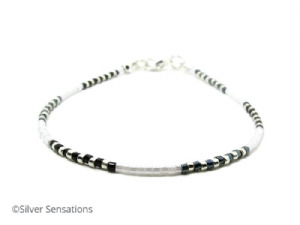 This slim handmade seed bead bracelet has jet black, glossy silver & white high quality Miyuki Delica seed beads. 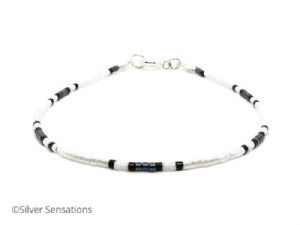 Arranged in a symmetrical pattern, these pretty seed beads complement each other so well to create the bracelet's monochrome design. Finished with a with a silver plated bolt ring clasp & fittings the bracelet in the picture is just under 7.75" in length. Please select your preferred length from the drop down menu & I'll add or remove beads at the ends of the bracelet in keeping with the design. These seed beads are just under 2mm wide so why not create a layered gypsy look with lots of these bracelets in different colours or shades? I have many colours of beads available, so if you would like a different colour please contact me. All my plated materials are bought from reputable suppliers as conforming to EU Safety Directives so are lead & nickel free.